I've benn watching IGBT modules for a while now and found two,but not sure which one is better for my ~150kHz coil. First,the MG150J2YS40 TOSHIBA module,which is the faster one,with Fmax1=307kHz in the worst case.I planned a full bridge with EU mains rectified to run around at 500A.The datasheet doesn't mention the switching losses so I can't calculate else. 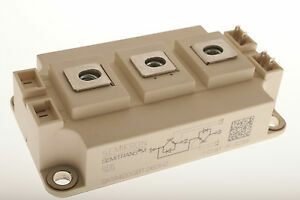 The second is the SKM400GB126DH2 Semikron module (what is the meaning of the H2 suffix?) which is larger than the previous.I calculated Fmax1=350kHz.Sadly,the turn on- and off energy is large ,Eon=29mJ and Eoff=48mJ ,so Fmax2=20kHz at Tj=80 and Tc=50.This frequency limitation is a bit scary,as I'd like run it at 150kHz.Is it still possible?If the Semikron modules can run at my frequency,a half bridge of it or a full bridge of TOSHIBA modules is more efficient? Netzpfuscher used similar modules in his Next Gen DRSSTC with lower current rating,but at lower frequency.I bet a medium size coil like mine could produce huge sparks with a compatible Semikron driver and freewheeling,like Philip's DRSSTC V.
The prices are close,two TOSHIBA modules 80 euro,two Semikron modules 105 euro. I use both IGBTs. The SKM200 with around 500A@63kHz Peak and the SKM400 with 1000A@58kHz peak. You must reduce the switching losses from the datasheet. The numbers are for hardswitching. I get Fmax2=193kHz@1000A with 1000µs Ontime and 800Bps from my calculations. Note that the gate charge of the SKM400 is pretty massive - that's a lot of power going into gate drive at 150kHz, and you'd struggle to drive it for long on-times (though a UD2.x should be OK for a couple of hundred microseconds). Do you have any other coil specs you can share? A 400A brick is likely overkill for a small coil and I'd be surprised if there is nothing else on ebay somewhere in between the two modules you've found. Thanks for the help,Hydron and Netzpfuscher! Well,then it's definitely possible to drive them at 150kHz and I probably wouldn't even go up to 1000A with a medium sized coil. I planned two different GDTs to drive a full bridge,each on IRFZ44N + IRF4905 output stages which can supply plenty of power I guess. These are the cheapest used IGBTs on ebay that I found in EU.The prices are really close,so I will choose the Semikron modules.The reason to buy modules is the lack of low inductance design with TO-247 modules and I don't want to order PCBs or etch double sided. Since the Semikron modules are 1200V and using a full bridge on 320V will not make useful their full voltage,a single module on voltage doubler would be the same? The coil,as calculated should be:125mm dia.,485mm long(1:3.88),1620 turns. MG150 is the best fitted IGBT in regard to silicon-to-coil-size ratio, the SKM400 is a complete overkill for a medium coil, BUT it will also be indestructible! You could just beef up the 24V section of the driver with a powerful PSU and some more capacitance, I did that on my DRSSTC4 with 26V/8A supply just for the gate drive. Add heat sinks! Thanks,Mads!I only have a UD1.3 driver,so no phase lead,but the Semikron modules can deal with that hopefully.I will try to build a mix of UD3 and UD2.7 to avoid the use of ultrafast comparators and variable inductors. Does anybody know something about the H2 ending of the SKM400GB126DH2 module?I found no information about it,but there's a similar listing(a bit more expensive)with the SKM400GB126D module that has datasheet.Should I go for the expensive one or the H2 is the same? @Netzpfuscher which type is your module? Thanks Teravolt,but the shipping price of that to EU is almost as much as the actual price. Nevermind,I ordered two SKM400GB126DH2 modules for 93 EUR(included shipping),crossed my fingers and waiting for them to arrive.Hopefully they'll be alright! Thanks for the advices and I'll post as soon as they arrive.